When charges against former Penn State football coach Jerry Sandusky first surfaced last month, many of us wondered how allegations of sexual abuse had gone uninvestigated for so long. Zielinski’s story is a peculiar one, and the film paints an incomplete if fascinating picture. Not much is disclosed about his mental state during the first half of his life. A photojournalist based for many years in Iowa, Zielinski was on the road to a promising career in the 1960s and ’70s, getting his work published in Life magazine and the New York Times, as well as in the pages of the Tribune. During Martin Luther King Jr.’s 1966 trip to Chicago, Zielinski took a remarkable photo of the civil rights leader that hangs in Zane’s office. A court case that Zielinski lost in the early 1980s (involving a dispute with his book printer) seems to be the fork in the road, but why this particular event knocked him off course remains unclear. For the past 30 years he has been dismissed by pretty much everyone as nut case. Zielinski all but presented himself as a film subject two years ago when he wandered into a public access television station in Columbia, Mo., where Walker and Thompson were working. “We were the only ones there, and this guy walks in with a cruddy VHS camera that was covered in a wasp nest and he said: ‘I have a tape stuck in here that will bring down the U.S. government, I need your help!’” Zielinski made several return trips to the TV station, and the idea for the documentary was born. Zane was upbeat during our chat, but his demeanor belied a complicated family situation. “I was born in ’73; my parents got divorced in ’79 but they didn’t tell me until ’83.” He has an older brother with severe autism, and it is in these portions of the film that Zielinski seems most stable — a patient father with his son. Zane disagrees with how his father is portrayed (and is currently not on speaking terms with his mother, who he feels was untruthful in the film). He is also, in some ways, his father’s son — a touch eccentric (he calls his father John), and is eager to talk your ear off while remaining vague when comes to the nitty gritty. “As far as I know, he is still in Columbia,” he said when asked where his father lives these days. “Zielinski” screens at 8 p.m. Friday at Chicago Filmmakers. Co-director Ryan Walker and Zielinski’s son Zane will be in attendance for a post-show Q&A. For more info go to chicagofilmmakers.org. We’ve been trying and trying to get our film screened abroad. See our bananas page for proof. We found refuge in Hamburg. The more I read about this festival the more intrigued I become. I think ZiELiNSKi will be a great fit for this year’s line up. Thank you, RADAR, for selecting our film! If anyone knows somebody that lives in Hamburg, and wouldn’t mind a couple of well-mannered dudes sleeping on their couch for a couple of days, please let us know. We are currently working on a new trailer just for the event, so stay tuned. Also, our brand new DVDs should arrive in the next 2 weeks. There are only 100 for now so email us if you would like to reserve a copy. We’ll keep you posted on screening times and dates as they come to us from Germany. We are pleased to inform you that ZiELiNSKi will be screening on Friday, October 7th at 8:00 pm as part of Pickford Film Center’s DOCTOBER. In 2006, Pickford Film Center joined forces with True/False Film Festival, in Columbia, Missouri, to produce True/False West Film Festival, which won a 2007 Mayor’s Arts Award, and shocked Bellingham with over 25 films in three days at several venues. While the festival was a success, festival politics made it untenable to continue as a Spring festival. From this festival, Doctober was born in 2007 in an effort to continue to bring great documentaries—and often guests—to Bellingham, and give our patrons a month to see as many as possible. Tell ‘em James and Jesse sent ya’. 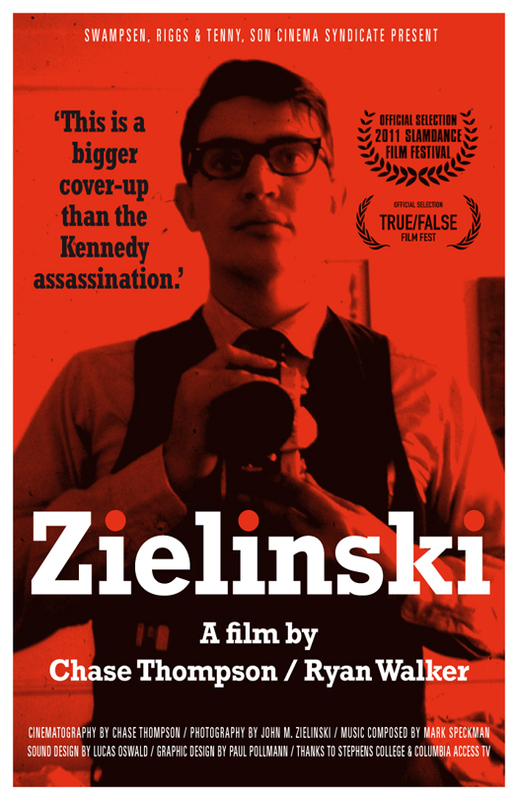 Friends, ZIELINSKI is now available to view on demand. Visit our filmDIY page or click below to watch now. Flew to Pennsylvania with my family for the 4th Philadelphia Independent Film Festival. Stayed in a hotel at 13th & Race. Walked through the neighborhood for some hot Mexican food. Taxi to the Franklin Institute to see Virtual JFK in an IMAX theater. Saw the massive Benjamin Franklin National Memorial. Walked around Independence National Historical Park in the heat. Did an interview with Rich Gardner at The Bourse. Stopped by Media Bureau and chatted with Benjamin for a while. Met up with my aunt and uncle (who live in Lancaster, PA) for a delicious Italian dinner. Talked baseball with my dad and uncle. Fell in love with decaf coffee. Took a Big Bus tour of the city = Philadelphia is amazing. Got lost in the Reading Terminal Market. Screened ZIELINSKI at Media Bureau. Cab ride to Penn’s Landing, which was popping on a Saturday night in June. Found a place to eat, which turned out to be a sports bar, which turned into a karaoke bar during our meal. Guinness, oh sweet pint of Guinness. Took a subway ride with my dad to Citizens Bank Park to see the Phillies vs. Athletics. Roy Halladay pitched a brilliant game and the Phillies won. Met back up with the ladies and took a taxi to Fishtown for a killer meal at Kraftwork. Oliver Stone’s JFK was on TV. Back to Penn’s Landing for old school ice cream at The Franklin Fountain. Thank you to Benjamin and the whole PIFF crew! Looks like a really cool line-up of films! Macomb, IL – Macomb native Ryan Walker will return home in May with his recently-completed documentary. Walker attended Western Illinois University from 1998-2000 before transferring to the University of Missouri and graduating in 2003. He is the son of Ron and Leslie Walker, of Macomb. “Zielinski” made its world premiere with two screenings at the 2011 Slamdance Film Festival in Park City, Utah. It was chosen from over 5,000 submissions. Walker said the film has done well despite its $3,500 “shoestring” budget. In March, the film was chosen for True/False, an international documentary film festival in Columbia, Mo. Nearly 1,000 people attended the four screenings. In April the film screened at the AMC Kansas City Film Festival in the “Heartland Features” category. In the 1960s and 1970s, Zielinski’s work appeared in “Life” magazine, the “New York Times” the “Chicago Tribune” among other publications. In a contract dispute, he lost $50,000 and professional credibility. Today Zielinski is described as the “most blacklisted author” in Iowa. For 25 years he has dedicated his life to exposing human traffickers, pedophiles, drug dealers and Satanists. The documentary film tells Zielinski’s story with 47 years of source material, new interviews and music by Mark Speckman. The filmmakers began collaborating at Columbia Access Television, a non-profit organization in Columbia, Mo. Walker has produced over 150 programs for CAT and programmed over 2,500 as its program director. Walker said that started an investigation that led to the film’s production. To watch the film trailer, read the filmmakers’ blog or see photographs visit zielinskifilm.com. Thanks to everyone who came out to our recent screenings at Ragtag Cinema! It was really cool to see so many friends checking out the film. My favorite Q&A was the one dominated by a few of John’s neighbors, who had awesome stories to share. It was fun to see John Zielinski holding court at the gangster booth four nights in a row, selling enough prints to make his rent money (barely). His photo display is still up on the walls at Ragtag – check it out if you get the chance. Thanks to the Ragtag staff for making us feel at home. Always a blast kicking it with composer Mark Speckman. If you haven’t checked out the ZIELINSKI soundtrack yet, do yourself a favor. Just dip a toe into Mark’s website and see how it feels. If you missed the film, never fear. More screenings are on the way. Want to see ZIELINSKI in your town? Contact us!